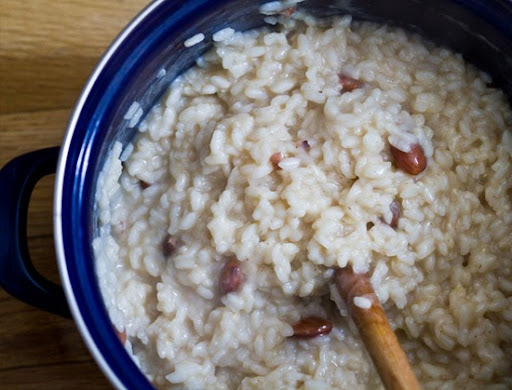 Inspired Breakfast Risotto. 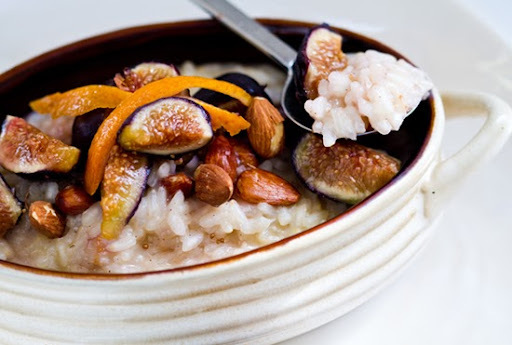 Arborio Rice, Citrus, Figs. 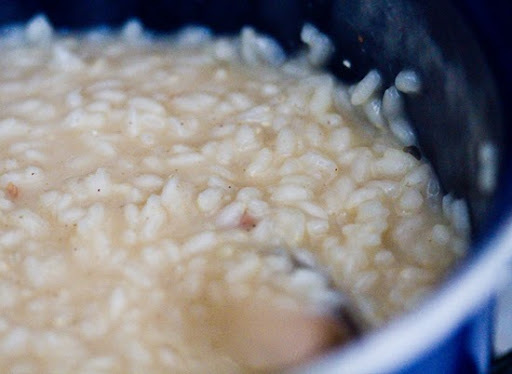 Risotto is one of my all-time favorite dishes. Accent it with butternut squash, peas, mushrooms and just about anything and I will come running to the table. 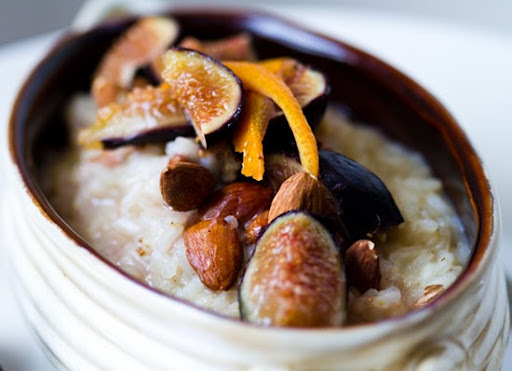 So when I saw a recipe by Joe Bastianich featuring Breakfast Soy Milk-Arborio Rice Pudding and Poached Figs - I swooned. And planned on making the next day..
My Recipe Spin. I took Joe's awesome already-vegan recipe and made a few subtle changes. I subbed the soy milk with almond milk. I added some whole almonds. 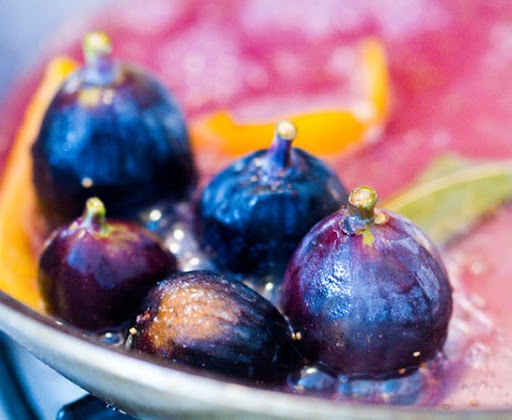 Switched up the splash of 'port' to 'sake' (since that's what I had on hand) for the poached figs recipe. Plus I added in some cinnamon and swapped the honey for my fave grade B maple syrup. 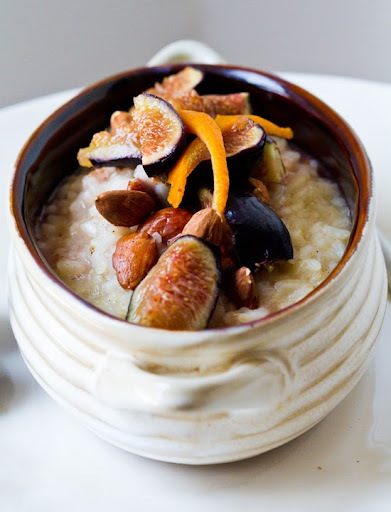 The results of my Almond Arborio Breakfast Porridge with "Sake Citrus" Poached Figs: glorious! I ate two bowls. Thank you Joe! The Flavors. 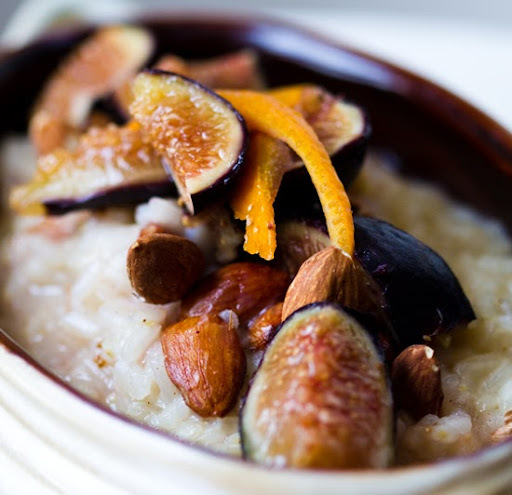 Sweet, tender figs dance with crunchy roasted almonds - all over top steamy, moist, creamy (yet dairy-free) arborio rice pudding/porridge/risotto. Whatever you call it, it is fabulous. And totally acceptable for breakfast. Fiber, complex carbs, protein from the rice and almond milk/almonds. Accented with warm layers of vanilla, cloves, cinnamon and maple syrup. Love. this. recipe. Meet Joe (Again). My favorite thing about the world of food is exploring the people behind the dishes. Behind the recipes. Behind the food blogs. Behind the restaurants. Or in Joe Bastianich's case behind the foodie mega-brands. You may know Joe Bastianich as Lidia's son. You know, "Lidia's Italy". Or you may know him from his recent foray into foodie reality television as a judge on Fox's MasterChef, along side Gordon Ramsay and Graham Elliot. His family's Bastianich brand also just launched Eataly NYC with Mario Batali. What you may not know is that JB used to be 60 pounds overweight. And that he is now a devoted runner and all around athlete. I get so excited about fit Chefs. There is nothing better than a Chef who is totally passionate about cooking, eating and staying fit. Joe Bastianich Photo from Runner's World (credit: Michael Lavine and Antonis Achilleos)..
"He's a dedicated runner who finds time (in the morning usually) to run up to 10 miles a day. Although he started running just four years ago, he's completed the New York City Marathon twice and the Los Angeles Marathon once. " - Runner's World article (link below). So how did Joe get so fantastically fit? Well he slimmed down without giving up his favorite foods, including pasta. He also loves and speaks very highly of a few of my faves: beans and veggies. Read about his love of beans here. Runner's World Spotlight. After reading this fantastic article in Runner's World about JB's healthy lifestyle I was inspired to reconnect to my Italian roots. 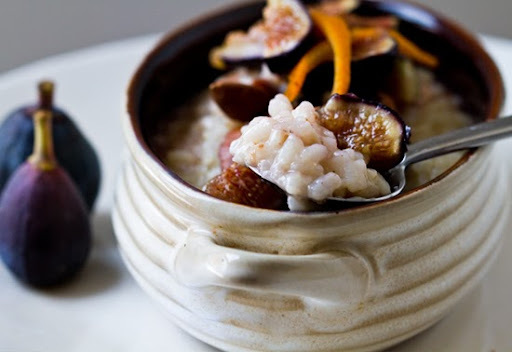 And why not start by whipping up some arborio rice with luscious figs for breakfast? Yum and yum. Here is JB's Arborio recipe posted online at Food and Wine Magazine's website. Want more JB recipes? There are some fantastic recipes (many vegan) linked from the Runner's World article. And now onto the yummy recipe!!.. 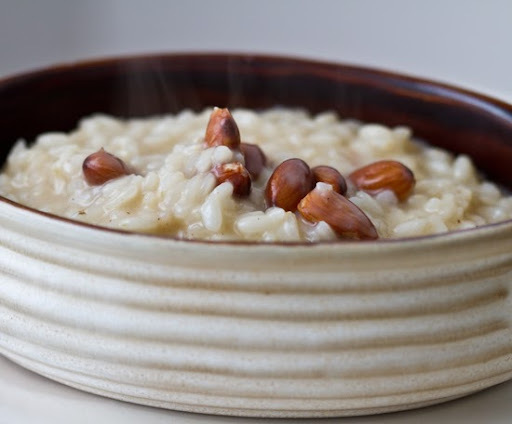 Steamy Arborio Rice Cooked for Breakfast! 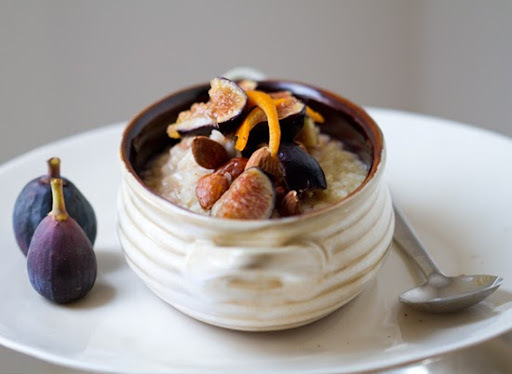 Nice change from oatmeal..
Then add some Poached Figs and voila! elegant, delicious, healthy breakfast..
1. 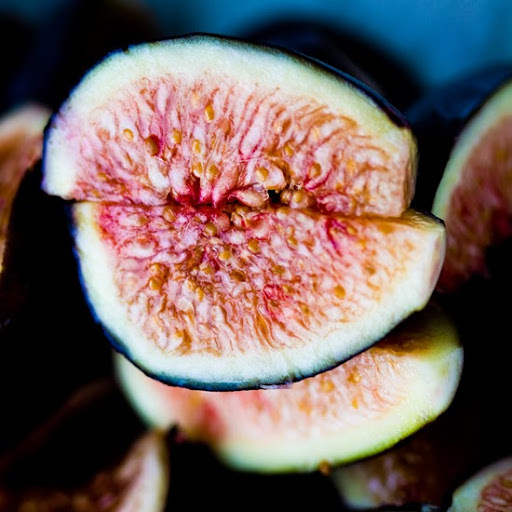 Begin by poaching your figs. 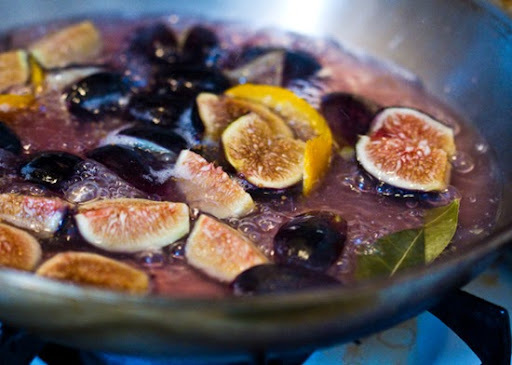 Add all the ingredients (except figs) to a skillet over medium heat. Dissolve sugar and bring to a slow boil. 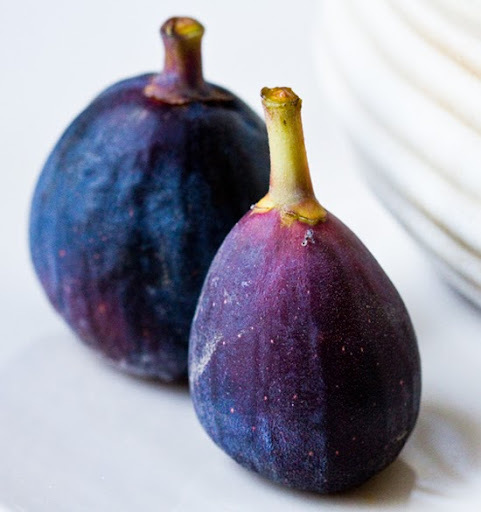 Add in figs, stem-side-up. Simmer until tender, about 1 minutes for me. 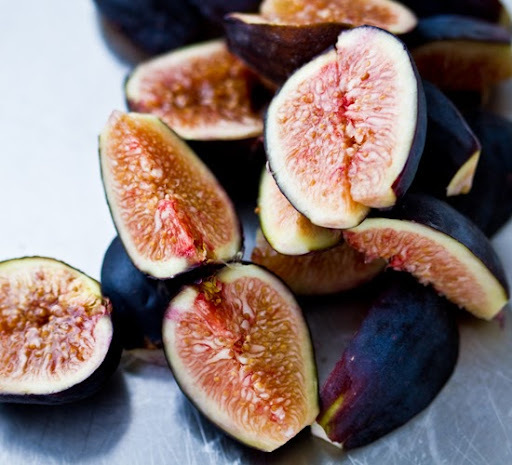 Note: At first, I quartered my figs and sauteed them. This allowed them to cook quickly, but they were slightly mushy. Either way will work - but keeping the figs whole will allow the skins to stay in tact - as opposed to falling apart a bit. 2. 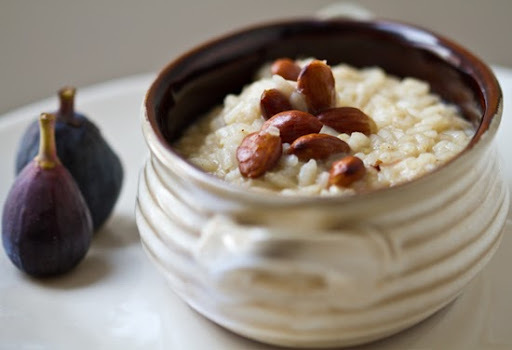 While you figs are poaching you can get started on your rice. In a large saucepan or soup pot add in your water, EVOO and salt. Bring to a boil - high heat. 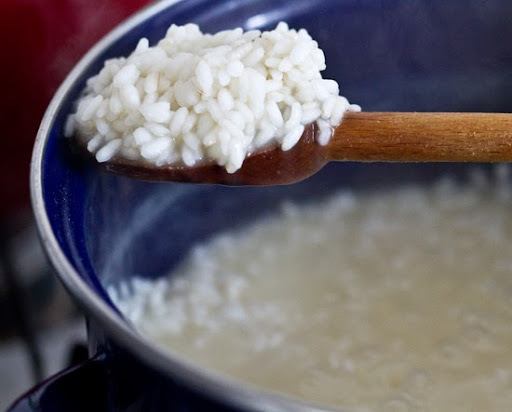 Add in your rice and stir continuously until most of the water is absorbed - reduce to medium heat. Low boil for about 15 minutes. Next up is adding the almond milk to intensify the 'creaminess'..
3. Next add in your almond milk (still stirring continuously) about 1/2 cup at a time until it is absorbed. Repeat until all the almond milk is used up. 4. Next reduce heat to low and fold in your maple syrup, vanilla extract, almonds and cinnamon. 5. Add in another splash of almond milk if you like your porridge 'wet'. 6. 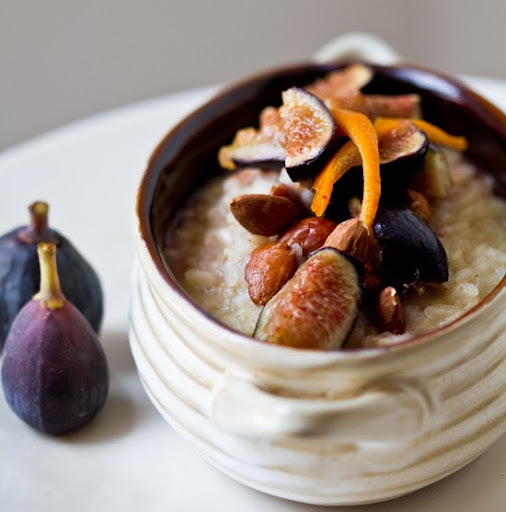 Spoon porridge into a bowl and garnish with the poached figs and a splash of the fig syrup. Add a few slivers of the orange peel and some additional almond on top. 7. Serve warm. Store leftovers in the fridge and reheat in microwave.